iZotope, Inc., the experts in intelligent audio technology, announced updates to Nectar and Music Production Suite in addition to the creation of the Vocal Chain Bundle. Nectar 3 has undergone a complete redesign, adding five brand new modules and new assistive audio features such as RX 7 Breath Control, and partner product Celemony Melodyne 4 essential. This update also includes improvements to twelve existing modules giving users the most sophisticated set of tools designed for vocal production. - Vocal Assistant: One-click custom preset creation created with machine learning technology to help a vocal fit in the mix in seconds. - Vocal Assistant: Unmask puts vocals at the forefront of a mix by carving away other competing mix elements directly from Vocal Assistant’s menu screen. - Dynamic EQ with new Follow EQ Mode automatically sculpts and shapes your vocal in real time, removing unwanted resonances and low end rumble while preserving natural character. - Auto Level Mode adjusts the level of your vocal before it even starts processing, eliminating the need for corrective dynamics or riding the fader. - Inter-plugin Communication: Nectar 3 can communicate with other instances of iZotope plug-ins in a session to address mix issues, tonal balance, masking and more. - Component RX 7 Breath Control plug-in for reducing unwanted breaths without sacrificing audio quality with the power of iZotope RX 7. - Celemony Melodyne 4 essential for GRAMMY-award winning time and pitch correction. - iZotope Relay: a hub for intelligently connecting your entire mix to your iZotope plug-in collection. - Hundreds of professionally-designed presets for music and dialogue applications. --- Delay: Two brand new modes and new independent controls for stereo support. --- De-esser: New interactive threshold design experience that can be auto-set with Vocal Assistant. --- Saturation: Two new Saturation modes, Decimate and Distort. --- Harmony: Increased number of voices that can be added from 4 to 8, improvements to MIDI mode experience for easier playability. --- EQ: Ability to add two EQ instances of up to 24 bands with Dynamic processing for frequency and pitch. --- Compressor: Ability to add two Compressors. New interactive threshold design with interactive visualization. --- Reverb: Additional third EQ node for additional shaping flexibility; immersive visual display. --- Dimension: New Chorus and Phaser modes with interactive UI. 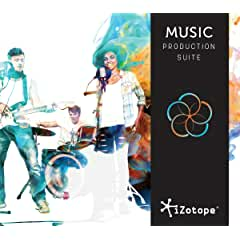 Music Production Suite 2 provides users with over thirty industry-standard plug-ins that interact across sessions and provide machine learning based assistive audio features, innovative new workflows, and cutting-edge visual analysis tools. Included in Music Production Suite 2 is Nectar 3, Celemony Melodyne 4 essential, RX 7 Breath Control, RX 7 Standard, VocalSynth 2, Insight 2, Ozone 8 Advanced, Neutron 2 Advanced, Tonal Balance Control, and iZotope Relay. The all-new Vocal Chain Bundle is designed to address all aspects of vocal production, and offers a collection of six plug-ins including Nectar 3, Vocal Synth 2, and RX Elements. With Nectar 3 comes Celemony’s Melodyne 4 essential: GRAMMY-award winning pitch and time correction as well as RX 7 Breath Control and iZotope Relay. Customers who purchase Nectar 2 Production Suite or Music Production Suite during the pre-release period will receive a free upgrade to Nectar 3 or Music Production Suite 2 when they’re released in November. Nectar 3, Vocal Chain Bundle, Music Production Suite 2 will be available in November.